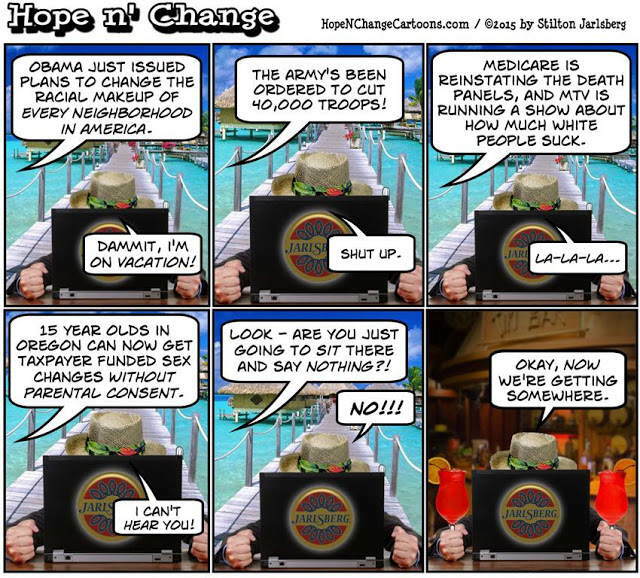 If you don't visit Hope n' Change Cartoons at least twice a week, Mother is going to be very disappointed in you. we'd certainly be commenting on one or more of the issues mentioned above. Probably in language which would frighten men, make women faint, and turn livestock barren. "When you put all those pieces together, or "connect the dots" as the Democrats used to say when Bush was in office, you see the entire fabric of American society being rapidly and deliberately unraveled by orders and edicts." Gives new meaning to the term "You ain't seen nothin, yet". The Post WWII vacation from reality that Western Civilization has been on is nearly at an end. Yes, the Greatest Generation saved the world from tyranny. Yes, we (The Greatest Generation and those who followed) save millions upon millions of people in the process. But its almost over now. Btw... anyone burning through the Socialist Media cone of silence and watching the Chinese Stockmarket laboring against its own collpse? The MAJOR reason why things have come to such a state is because the conveyance of information (in this information era) rapidly out-paced our ability to cope and adapt to it (radio, TV, cable hollywood, socialist takeover of education). Thus has sound bites, unsound logic, propaganda, social transformation via overt manipulation and out right brainwashing has badly infected our populus to the point that its clearly becoming very dysfunctional. "The practical problem in America has been that when the ruling class trains its united wrath against persons in any one sector — e.g., supporters of marriage as the dictionary and the law have defined it, or those who support economic probity or the right to keep and bear arms — the general public quietly stands by. No longer accustomed to speaking together, Americans hang separately. For the members of the public to transcend their isolation enough to threaten the ruling class’s hold on the commanding heights of American society would require a nationwide movement with which disparate individuals could identify, and which could encourage them to join together and speak up. NOW with the internet, we call finally combat the Orwellian Tactics of the Totalitarians because we can follow our own muse and have the guided far less. (John Phillips): "Is fox right to limit the debate to ten contenders, or is this an example of the media taking too much power on themselves." (Cond0011) With the technology we have today, I believe TELEVISED debates are OBSOLETE. Instead, with the internet they can have actual grueling Debate-Tournaments/Job-Interviews/historical-portfolio which will get down to the brass tacks of who they are, what they believe and what they have done to show they would be effective as the POTUS. Each Debate Tournament would be solely on ONE ISSUE that each person has prepared and will take a day each. Being that we have the internet, there isn't even a need that they meet in person. The debaters come in with their suit cases of evidence to push their case and debate each other one on one until everyone has debated everyone. Each debate has only a specific amount of time allotted - 1 hour debate time between individuals. The number of Debate Tournaments are determined by the number of issues needed addressing. I would think there should be AT LEAST 14 important issues (2 weeks of life-time for those who want to be POTUS) that need to be covered. Summary: Besides the video and the written transcripts of the debate; when the day is done for the specific tournament, each candidate will have a written summary of their viewpoint of the issue at hand and how they are going to solve it (thus the debate). It will be written in College Debate Framework and can only be several pages long. Additional footnotes and sources to back up this viewpoint not included in this limit. Then there is the credential side of things where each candidate is asked serious job qualifications questions. A video of the 2 hour long interview is posted along with the written transcripts of the video along with a written resume the candidate submits to show he is qualified to do the job. This is a wide open interview ranging from the track record of Job Skills/History, Academic focus/grades, & Actions/Ethics within the communities served. No judgement as to who won the debate or not by the GOP, instead, it should merely be a matter of record as a reference point for further approval whether by a grassroots movement or other means. To be a GOP candidate, they MUST participate in ALL these debates ENTIRELY as lack of a response in this information era is simply another maneuver and thus disqualify them from GOP representation. The New Media (Not the media we have today) can reference these debates in their news. The GOP can choose to charge a fee to some media outlets (Like the Lames Stream Media) and give freely to other media outlets (Those that remain impartial) as they see fit as there are some media that is soooo biased that they need to be starved of information and bypassed. My uncle Letsgo "Bantam King" Lozko was the same way. After working with chickens all day long he had a bunch of thoughts, insights, observations all stored up in his head. He'd come in the house, open a bottle of Schlitz (the beer that made Milwaukee famous) and start talking. "Down-loading" you youngsters would say. Boy oh boy. If I had written down half of what he said I'd be a rich man. I didn't, and I am not, sigh.